Please note the experiment availability as in table below. This experiment is AVAILABLE ON THURSDAY. Wait for few seconds till the 'set speed' is activated and can be selected. Select 'set speed' from the drop down menu as 0.1 or 0.15. Click 'start loading' and observe the Concentrated and Average stresses Vs Time. 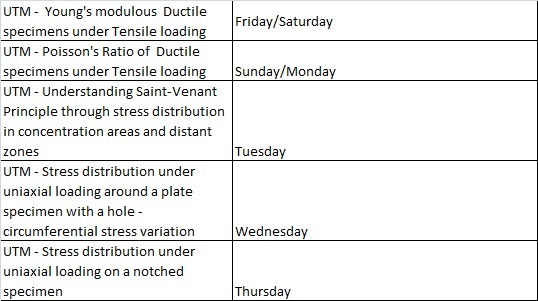 Observe the 'Station status' and view that the Actual load increases just above 3kN and then it decreases back to static state relieving the tension on the specimen. If the actual load is found is continuing in the negative direction, (keeping on increasing in negative value), click 'Stop loading'. Select 2 points on the Concentrated and Average stresses Vs Time graph and click 'Calculate Stress Conc. Factor' button. The software will ratio corresponding points on the Concentrated and Average stress lines, to give Stress Concentration ratio for the material due to the Notch effect.